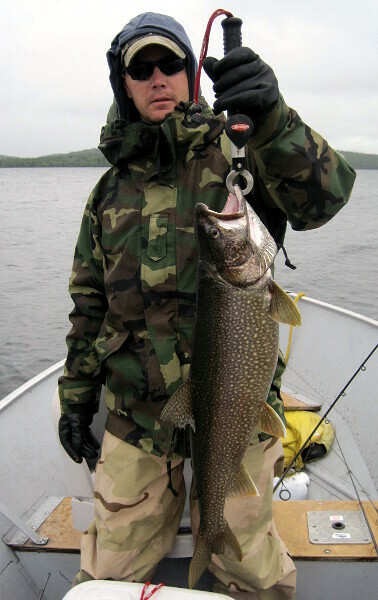 Anishinabi Lodge is a cozy little Northwestern Ontario Fly-In Fishing lodge on the picturesque Anishinabi Lake. 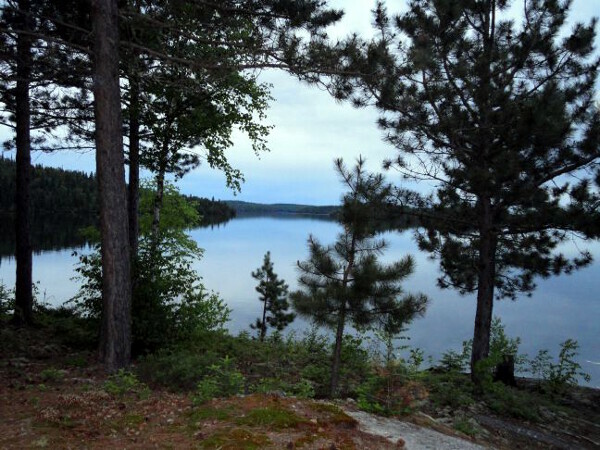 On the main island along with the lodge are four beautiful lakefront cottages. 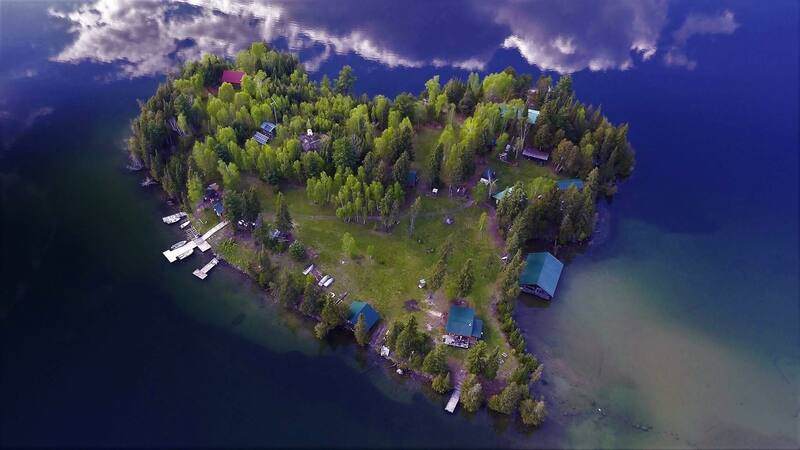 Away from the main island, also on Anishinabi Lake, are two beautiful and remote outpost cabins. 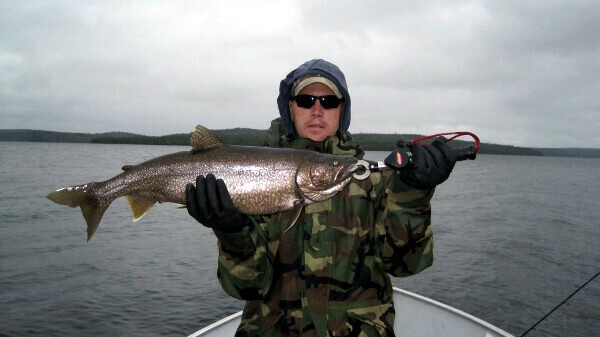 Experience first-class accommodations and fish Anishinabi for trophy Lake Trout, Smallmouth, and Northern. 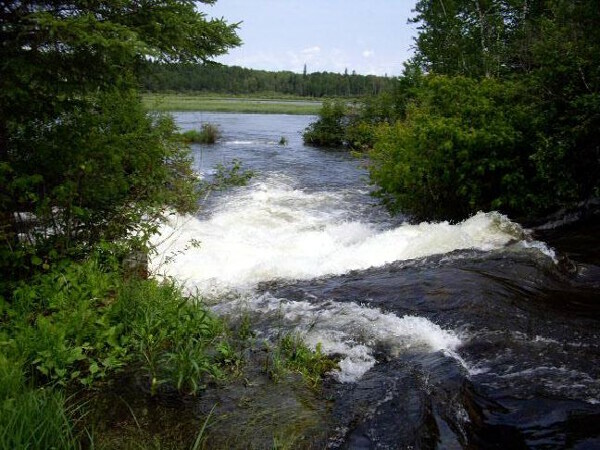 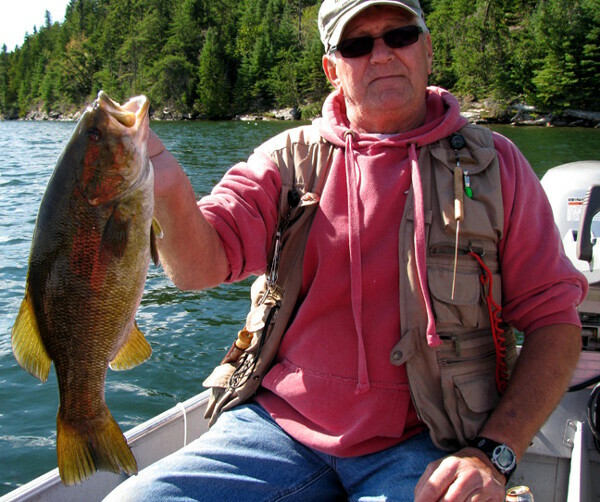 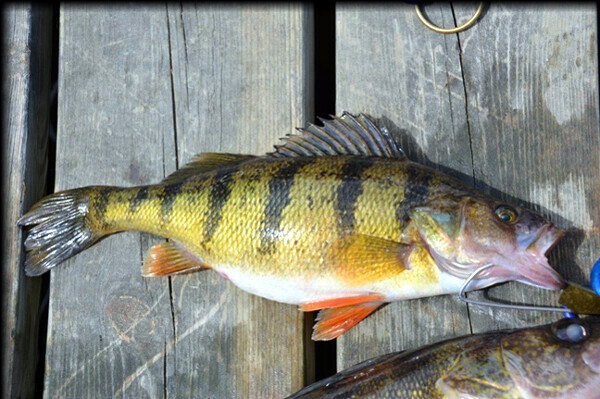 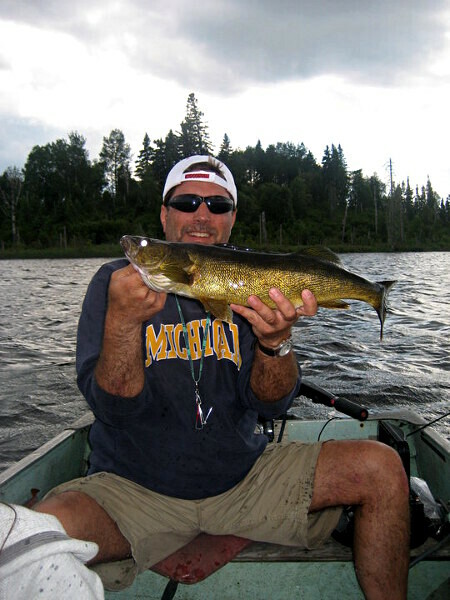 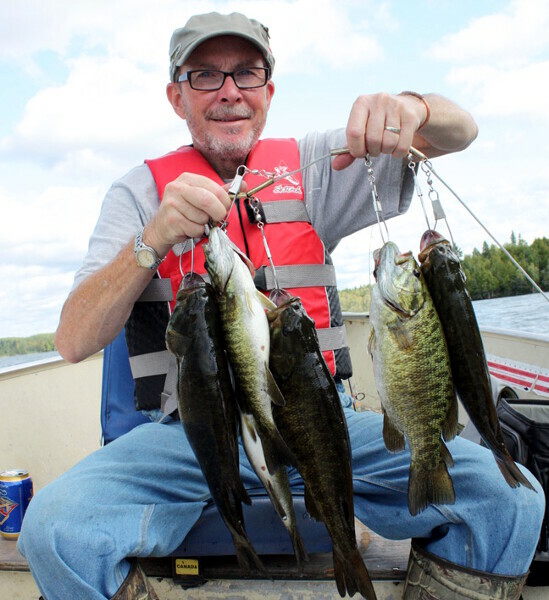 A short portage off of Anishinabi will put you into some of the best Walleye, Northern, Perch lakes in the area. 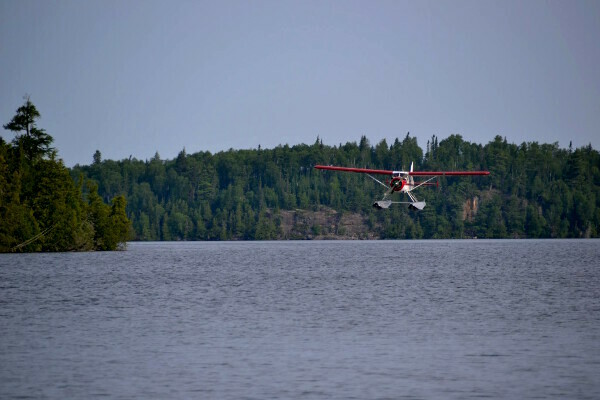 Our main base is at Northern Lights Resort on Cedar Lake, 25 miles North of Vermilion Bay, Ontario and Anishinabi is a quick 10 minute flight from there. 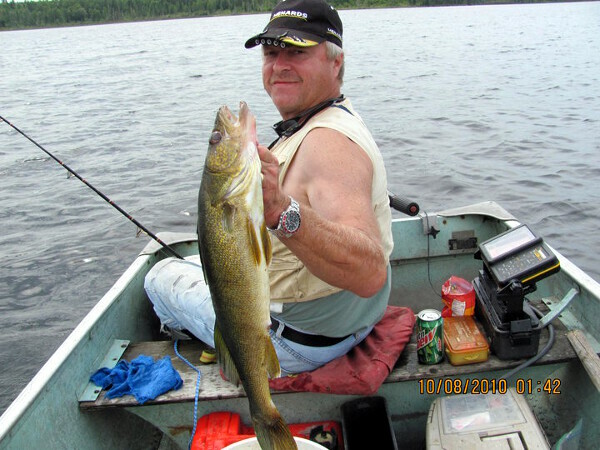 Our real claim-to-fame is the mind-boggling Walleye fishing. 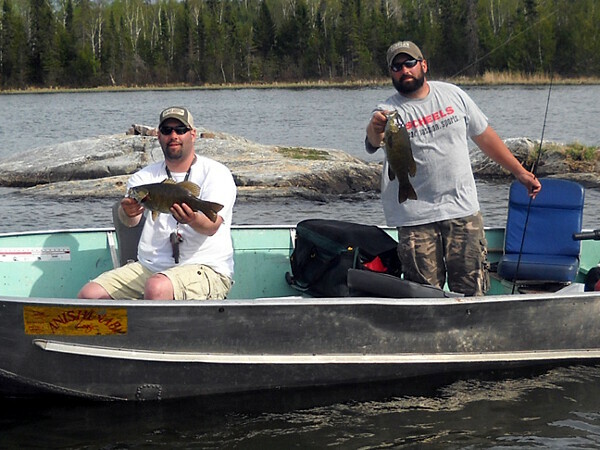 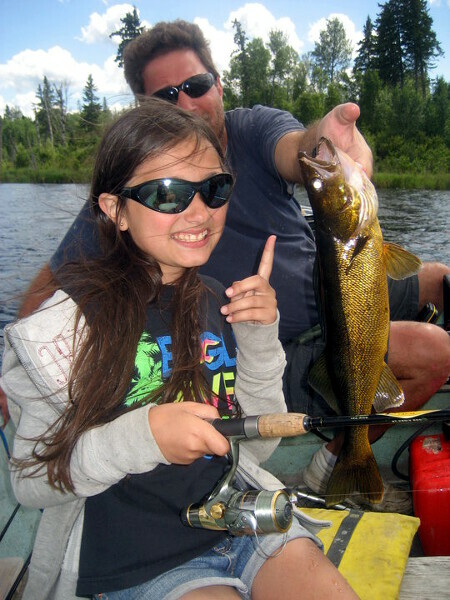 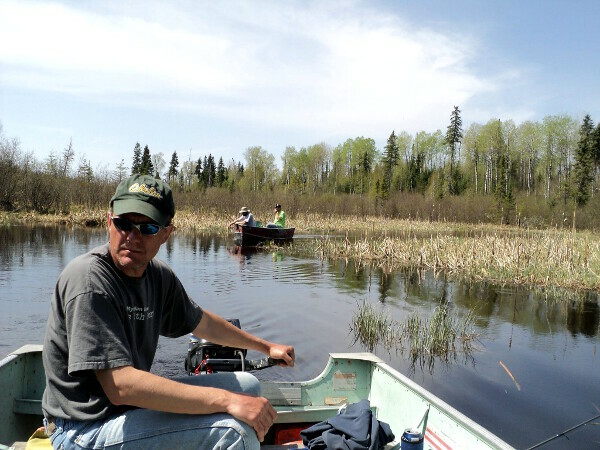 We have licensed boat caches on nine backcountry portage lakes, which are stuffed with Walleye. 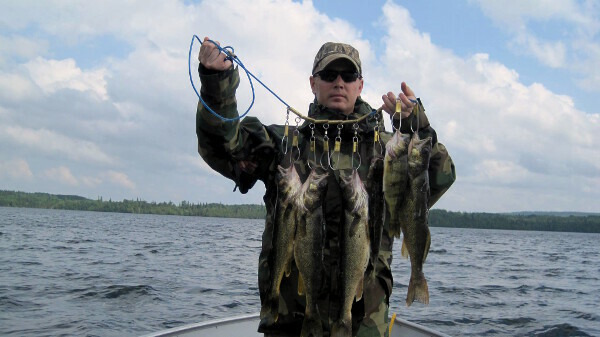 In these lakes it’s easy to catch 100 Walleyes in a day with the average size being about 20 inches. 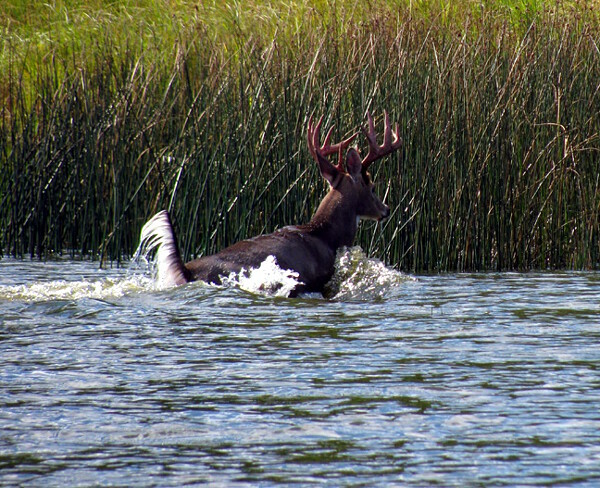 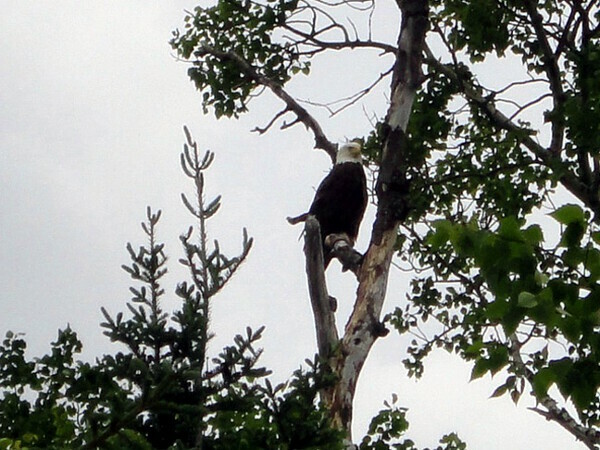 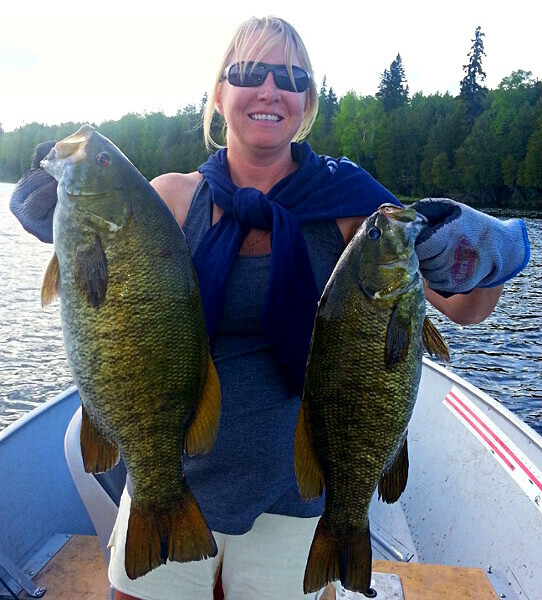 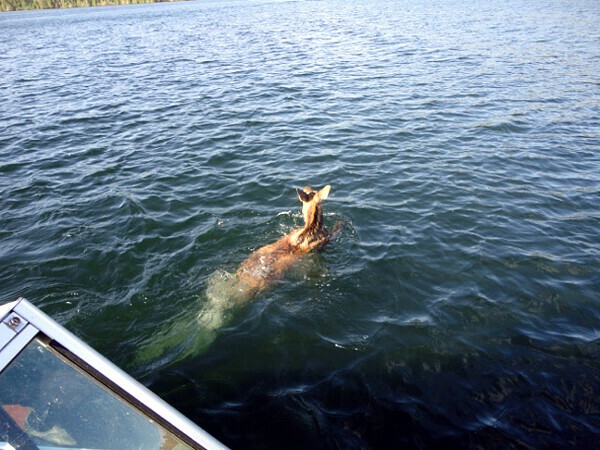 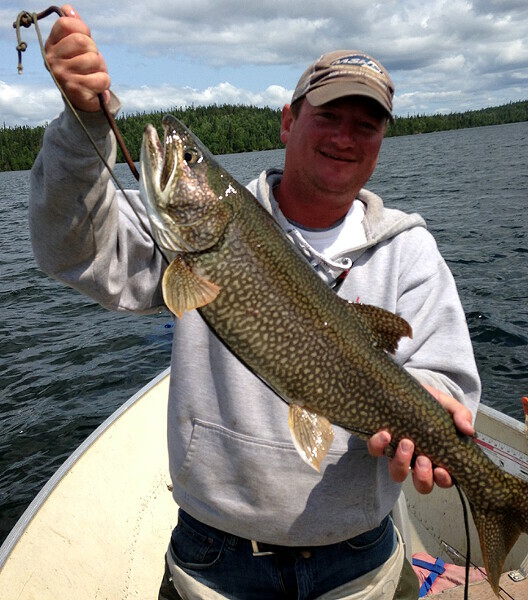 In these lakes guests are also running into bigger walleyes in the 25 to 27-inch range. 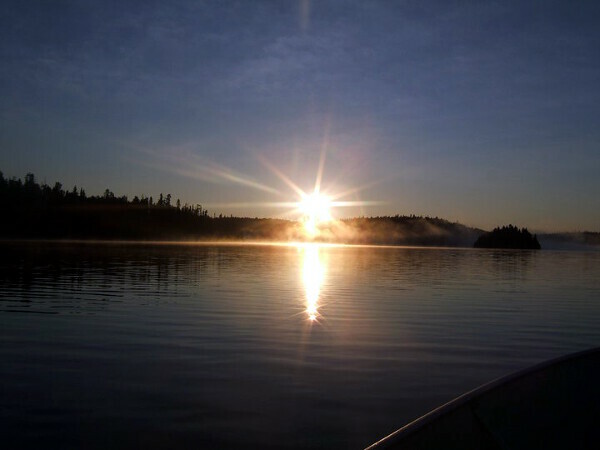 The ultimate jewel in our crown it Zizania Lake. 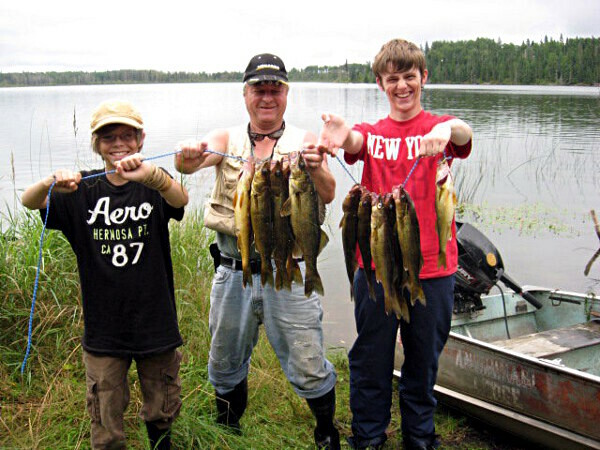 This is a fly-in catch-&-release only day-trip lake that is boiling with Walleyes that average 24 inches. 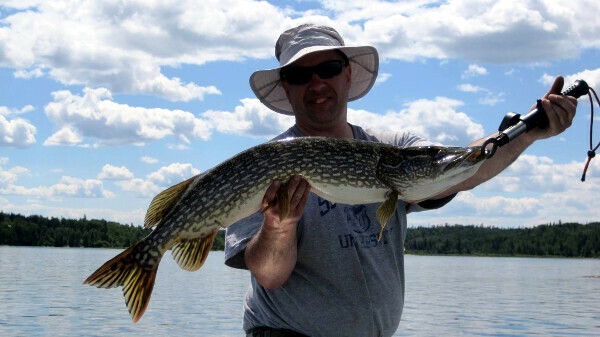 Not only will you catch ridiculous numbers, there is an outstanding chance at catching something big like a Walleye over 30 inches or a 20-pound Northern Pike. 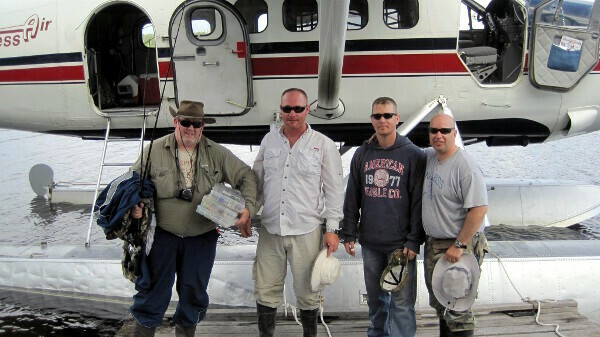 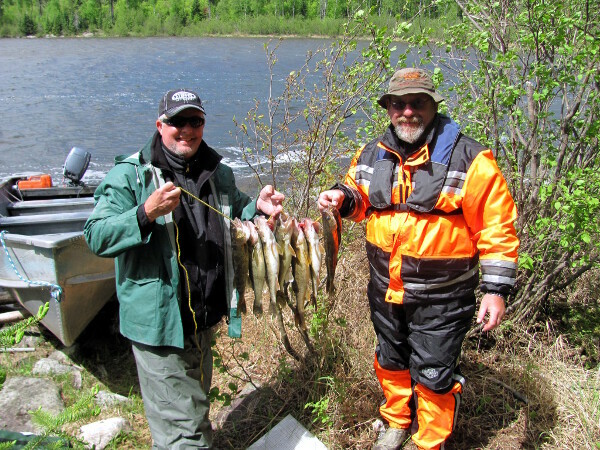 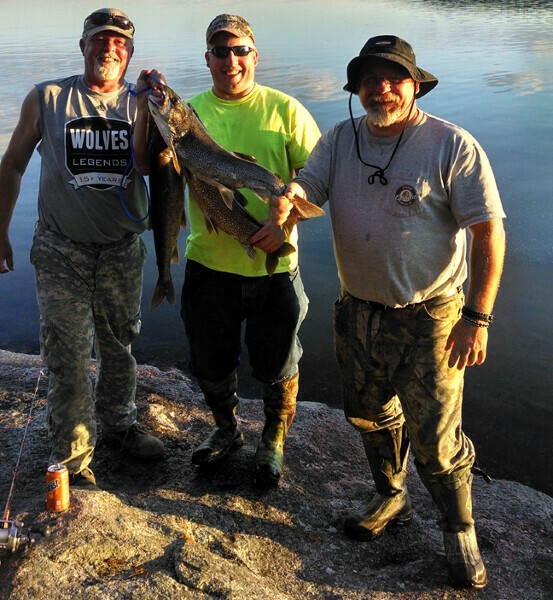 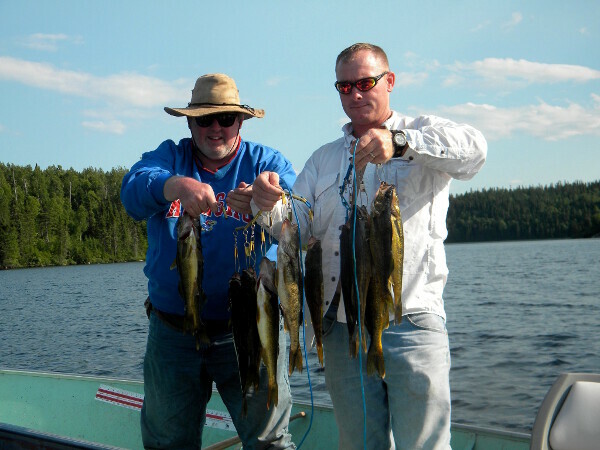 Two of our guests reported catching well over 250 Walleye between them in an afternoon on Zizania Lake. 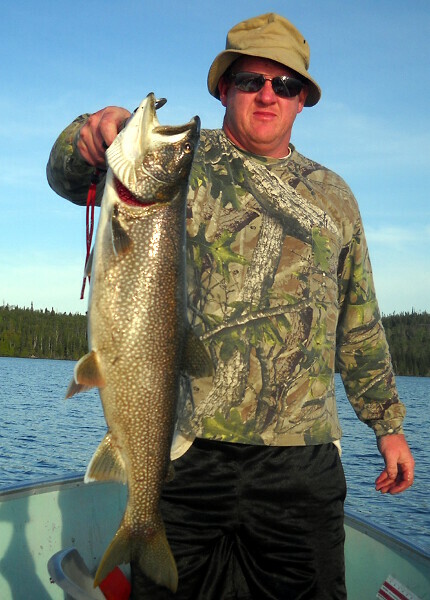 Lake Trout are the dominant game-fish in Anishinabi Lake and our guests can experience extraordinary numbers and sizes. 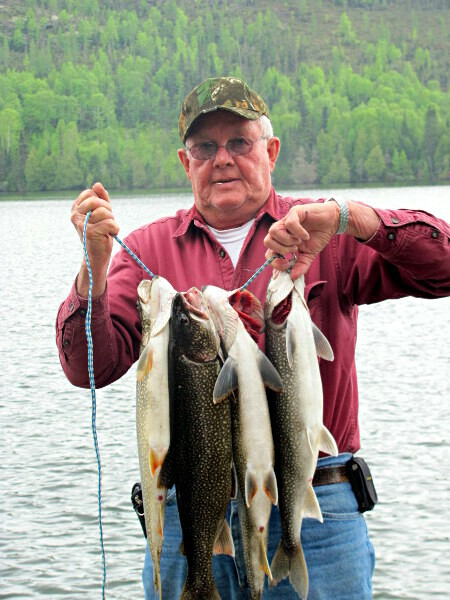 Lake Trout up to 12 pounds are common and a few lucky guests will catch Lake Trout in the 30-pound range throughout the summer. 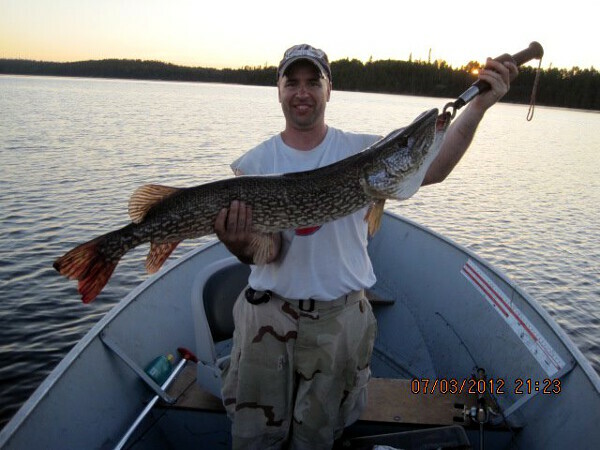 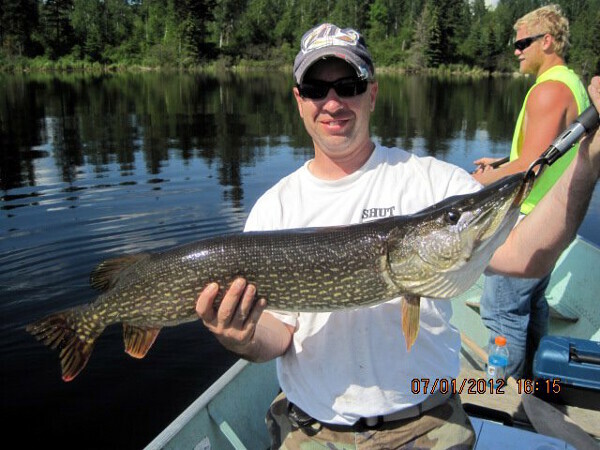 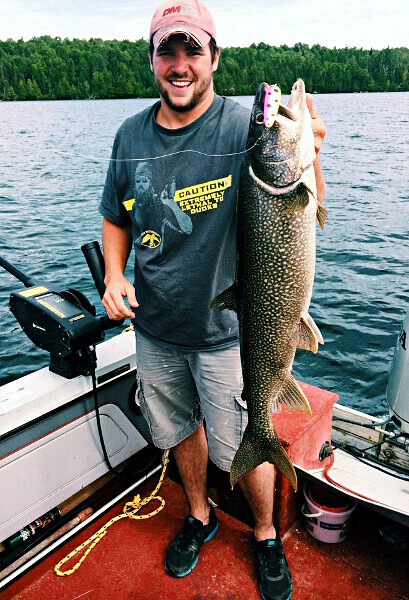 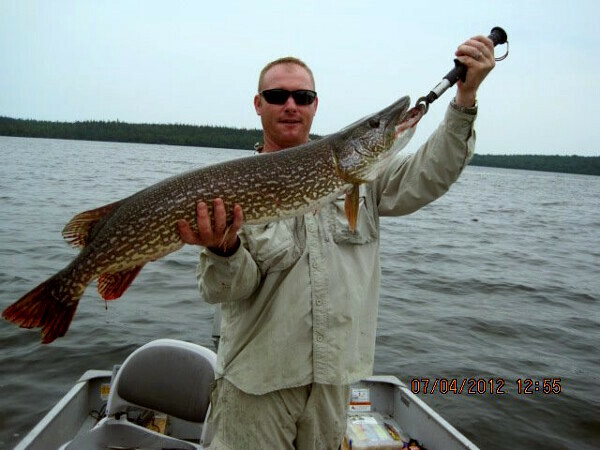 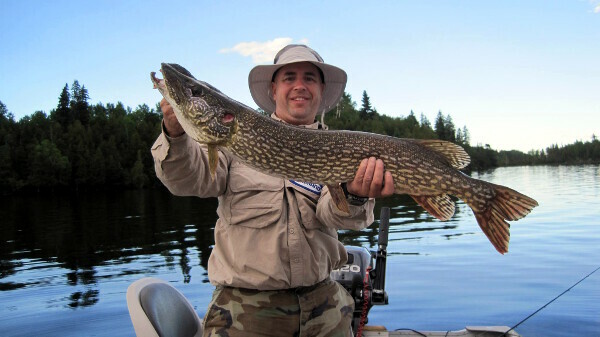 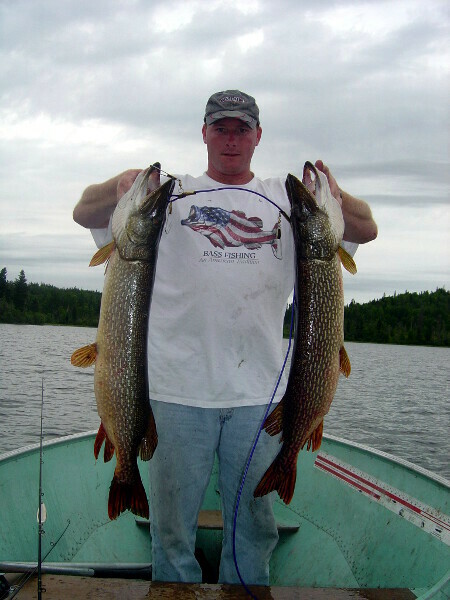 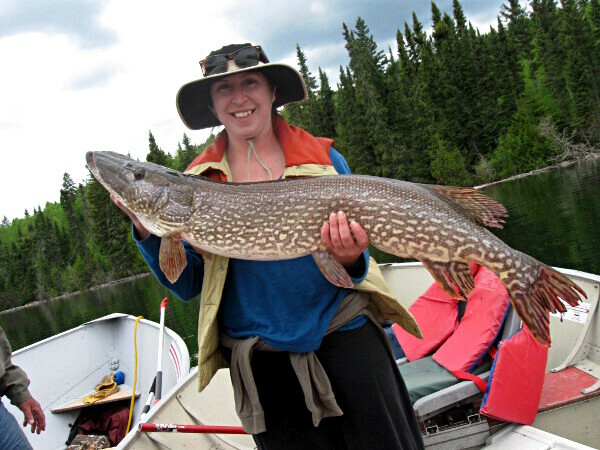 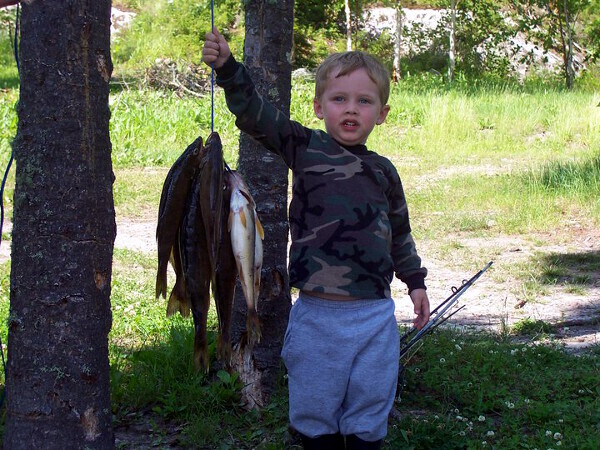 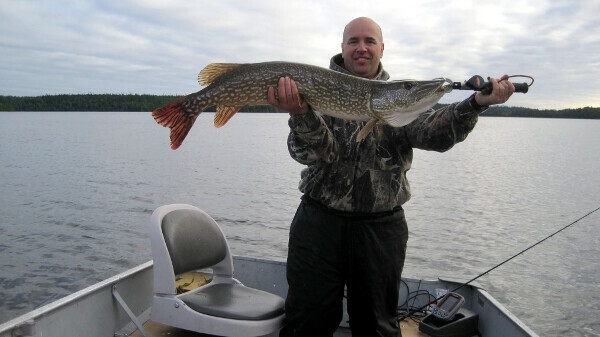 Both Anishinabi Lake and our remote backcountry portage lakes have outstanding Northern Pike fishing with good numbers of Northern Pike in the 2 to 6-pound range and lots of trophies being caught and released over 40 inches. 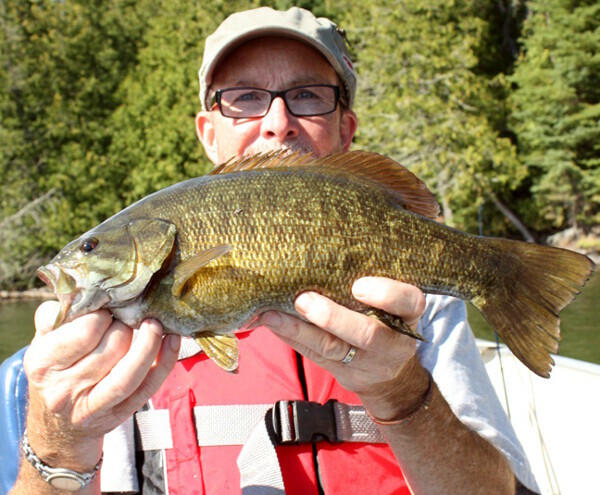 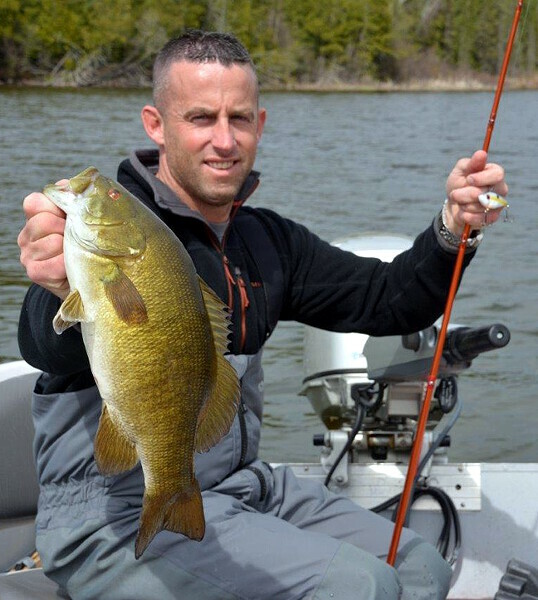 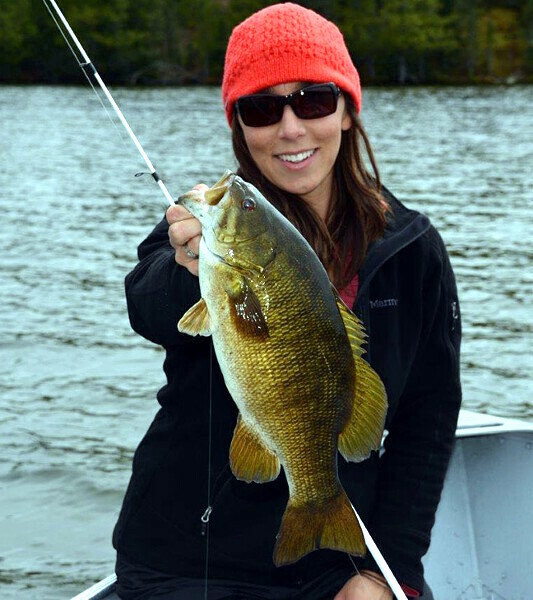 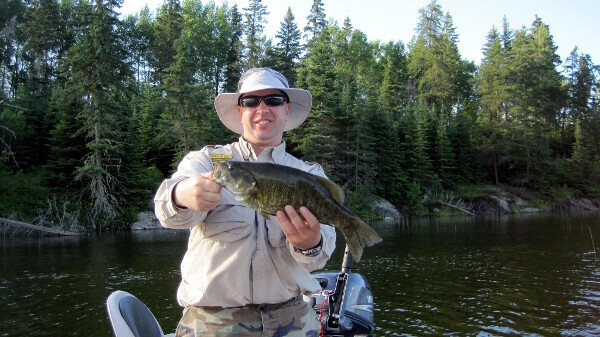 Smallmouth Bass fishing gets better every year with numbers being good and Smallmouth Bass up to 20 inches being caught. 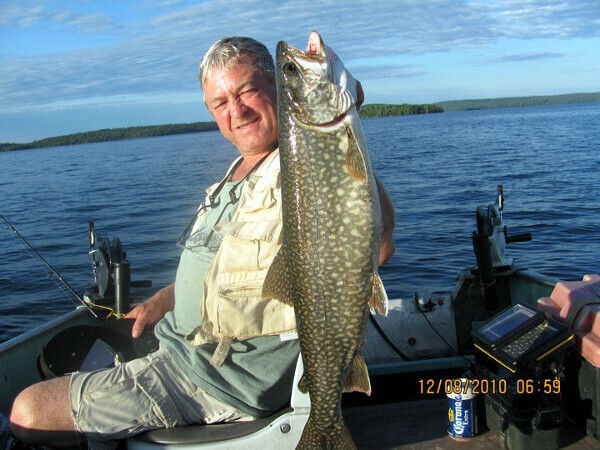 We offer both a main lodge on an Island with beautiful lakefront log cabin cottages, which are fully equipped for housekeeping and two outpost camps up towards the north-end of the lake. 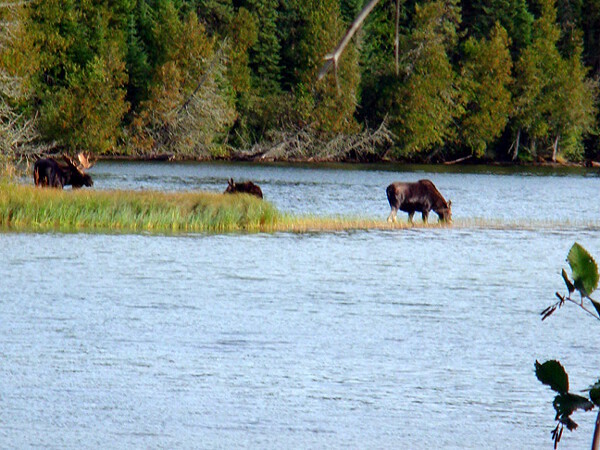 The main lodge is our summer residence but guests are welcome to drop by and watch the big game on satellite TV, check their email as we have WIFI or make an important phone call on our satellite phone. 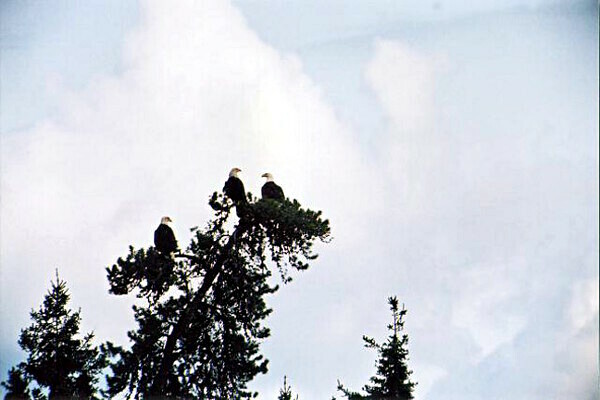 American Plan is available upon request with ample notice. 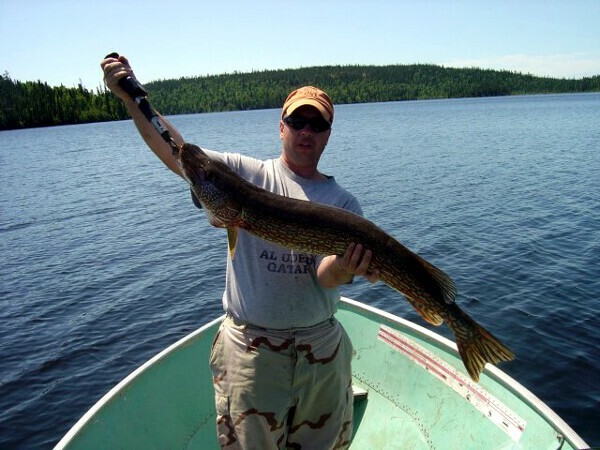 We have been actively upgrading and renovating our cottages and now offer accommodations with luxuries rarely found in such a remote corner of Ontario’s wilderness. 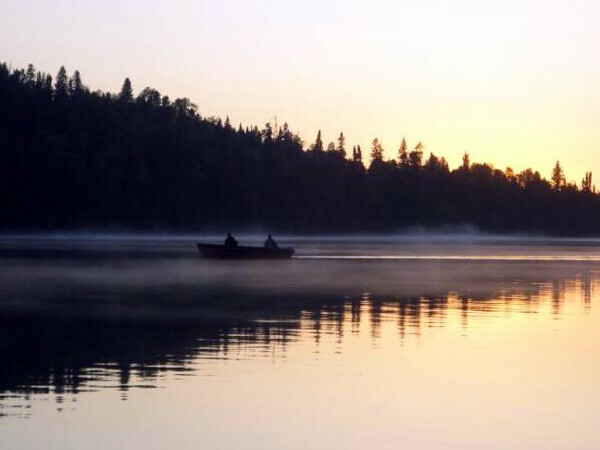 The new pine interiors give the cabins a wilderness ambience that will really make your stay with us enjoyable. 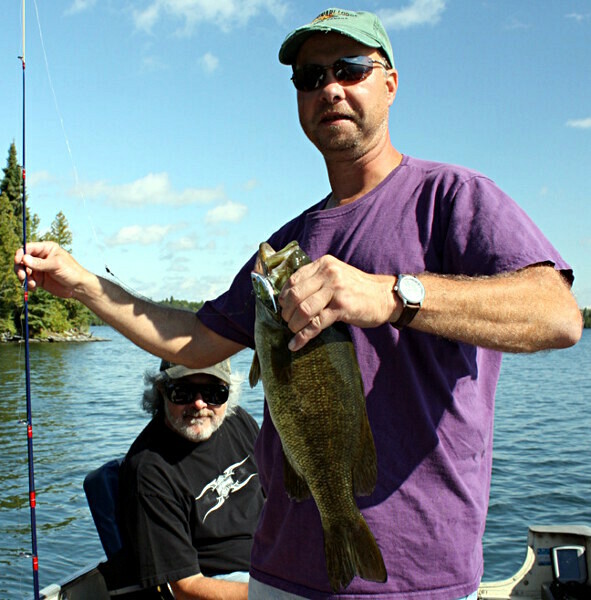 Our guests fish in comfort with our fully equipped Lund Fishing Boats with electric-start Honda and Yamaha outboard motors. 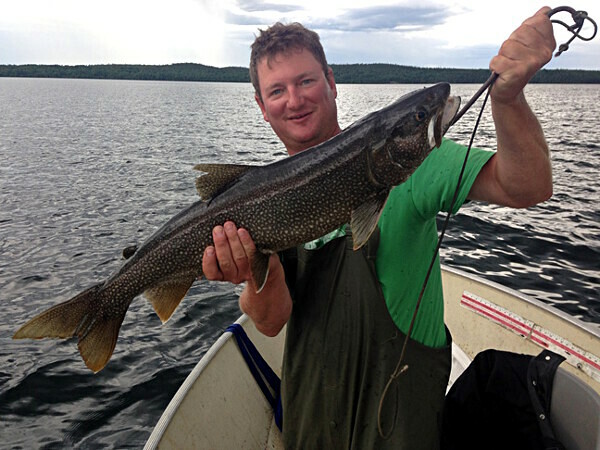 We open the lodge back up on January 1st and offer accommodations for snowmobilers that want warm and cozy accommodations and take advantage of our awesome ice fishing opportunities for Walleye, Northern Pike and Lake Trout. 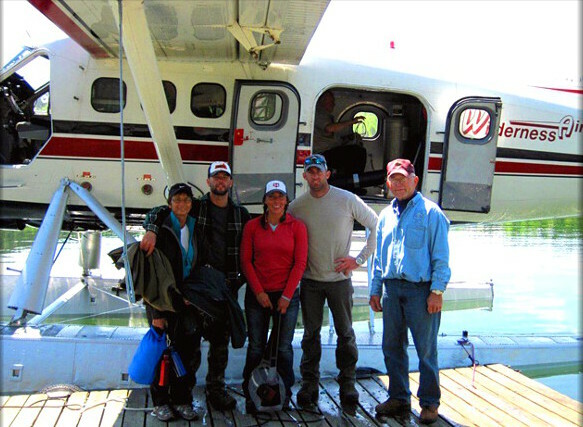 It’s a 40-mile snowmobile ride to the lodge, which is half the fun. 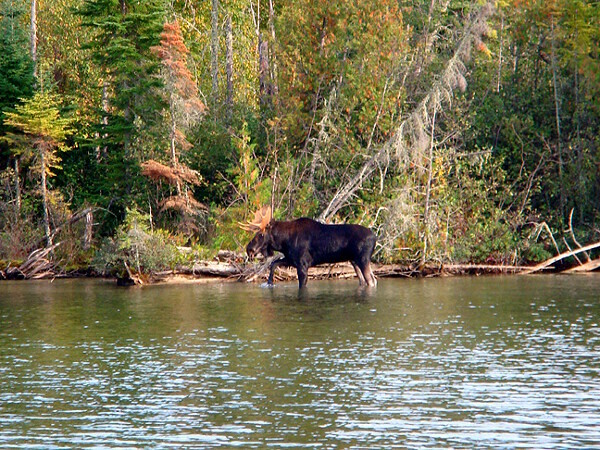 In the fall we run an organized Black Bear Hunt, as well as offer accommodations for Grouse hunters and resident Moose hunters with their on tags for WMU 5. 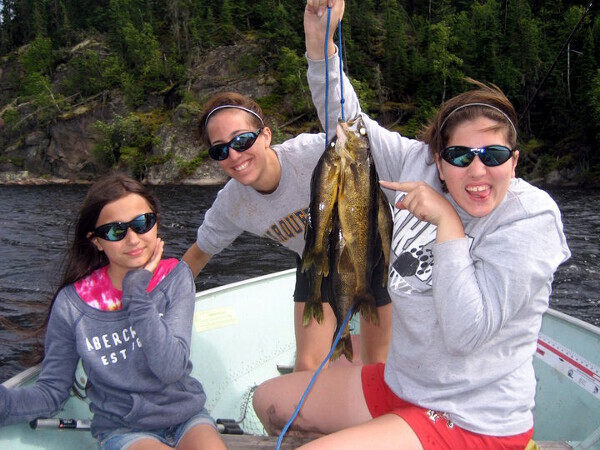 We are a small family-run lodge and for generations have been showing guests what it feels like to be treated right. 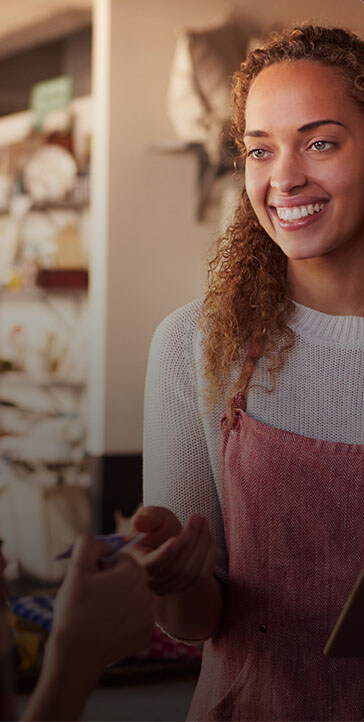 Please take a look through our website and feel free to contact us with any questions.